Smith Services, Inc. is a locally owned and operated company that began as Smith Heating & Air Conditioning in 1974, by its founder Richard Smith.Chip Woody purchased the company from the previous owner in 2003 and is the CEO. In that same year the company purchased C & R Air Conditioning of Stuart and Ewing Air of Wellington, because of their excellent reputation and history of serving their respective customer bases since the 1970’s. The company also purchased William Sanders A/C of St Lucie in 2008. Bob And Nanci became co-owners of the company in 2009 and in 2013 they purchased from Chip Woody. After giving it much thought, Bob and Nanci made the decision to retire. On December 31, 2015 they sold the company to Michael and Frances Brown, who have been long time employees and Davide and Kristine DeBlasio. Many people have asked us about how our company logo, “SMITTY“, came about. The concept of fast service was behind coming up with something that could capture the concept. What better choice than a Greyhound. The previous owner actually owned Greyhounds and over the years employees were encouraged to rescue a Greyhound and the company paid for the adoption fees. In addition to air conditioning & heating, Smith Services offers a complete range of services for residential and commercial mechanical equipment, including pool heaters, ventilation, humidity control, air purification, light commercial refrigeration, chilled water systems, and design built services by the construction department. In addition, heresite coating, duct sanitizing, dryer vent cleaning, central vacuum systems and indoor air quality has been added over the years to our list of services offered. We offer maintenance agreements for both residential and commercial. 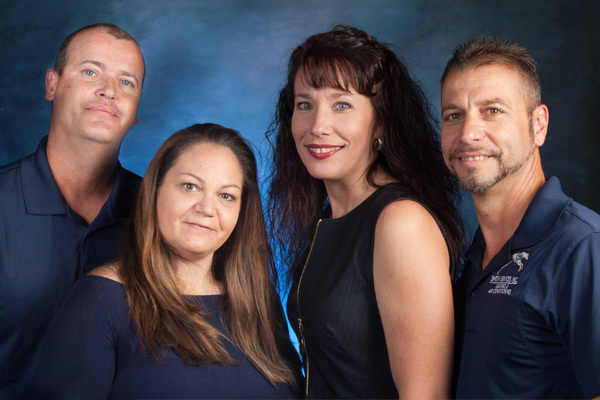 We service Brevard, Indian River, St Lucie, Martin and Counties and have proven our commitment to customer satisfaction since 1974.